Welcome to my blog, especially to any first time visitors finding me through the blog hop. 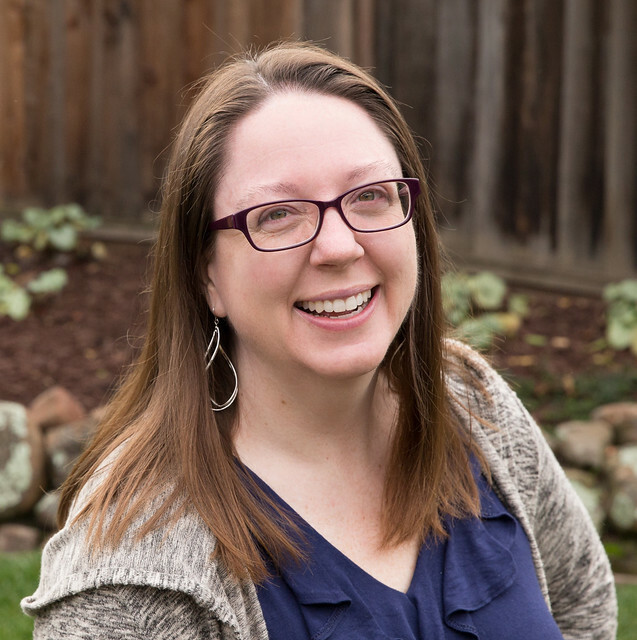 I'm joined by almost 70 quilters over the next three days for the 2016 Cloud9 New Block Blog Hop, hosted by Yvonne @Quilting Jetgirl, Cheryl @Meadow Mist Designs and Stephanie @Late Night Quilter. Each participant has designed and created a 12" finished block that will be donated to the hosts to make into charity quilts. And we've each created a free tutorial of our block for you. Our hosts curated this Berry Harvest bundle of Cirrus Solids from Cloud 9: Amazon, Sky, Iris, Lilac, and Shadow. Cloud9 generously donated fat quarters of each fabric to each participant. I love this palette. Purple is my absolute favorite color and, in general, I'm a fan of the cool side of the spectrum. Early in the design process I began toying with a design involving transparency since I liked the idea of two layers of the lighter color "overlapping to create" the darker color. Initially I was working only with rectangles. 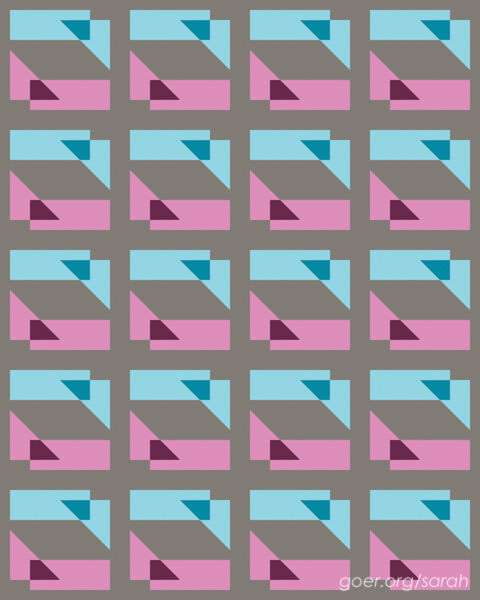 It was late in the game that I decided to make one shape a triangle, forming a trapezoidal overlap. This also allowed me to create a design with rotational symmetry within the block. Here is my final design, Geometric Transparency. A. 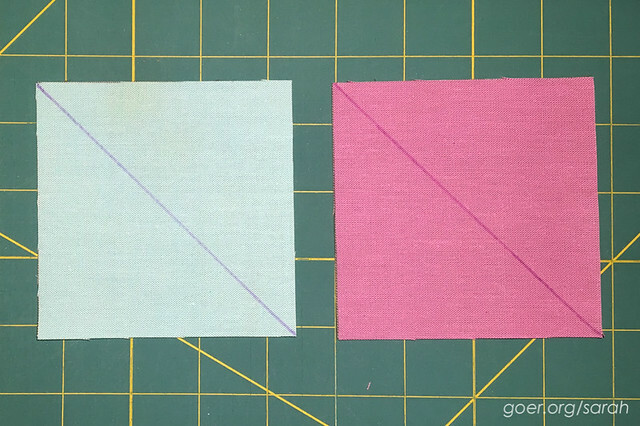 (1) 2.5-inch by 3.5-inch rectangle. 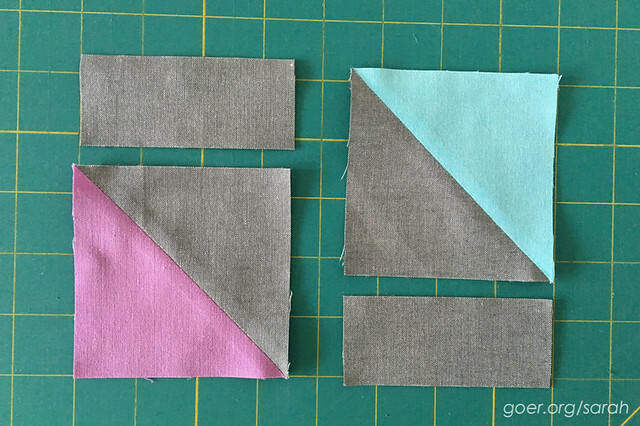 Sew all seams with an accurate 1/4" seam allowance. My seams are pressed open, using a shortened stitch length of 2.0. 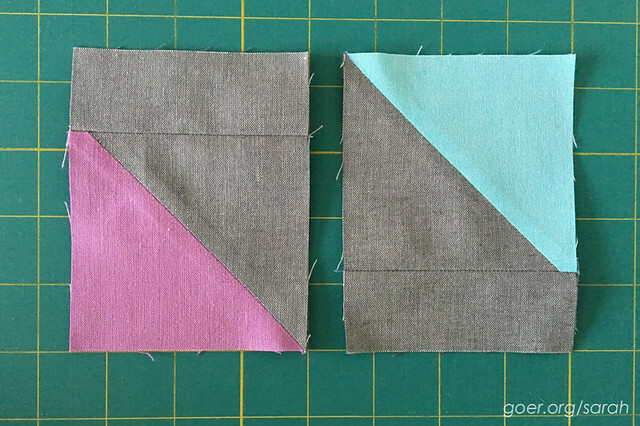 I find pressing seams open helps me match up points and makes free motion quilting easier. 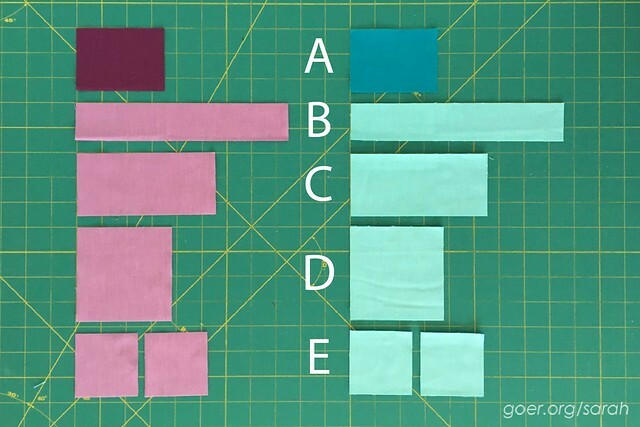 Step 1: Use 2.5-inch by 3.5-inch dark fabric and coordinating light 2.5-inch square. Mark diagonal on each square as shown in first photo below. 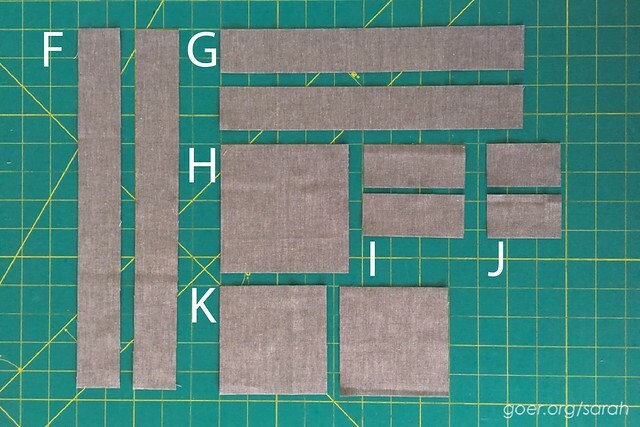 Sew on marked line and trim off excess fabric 1/4" from stitching (second photo below). Press open (no photo) and set aside. 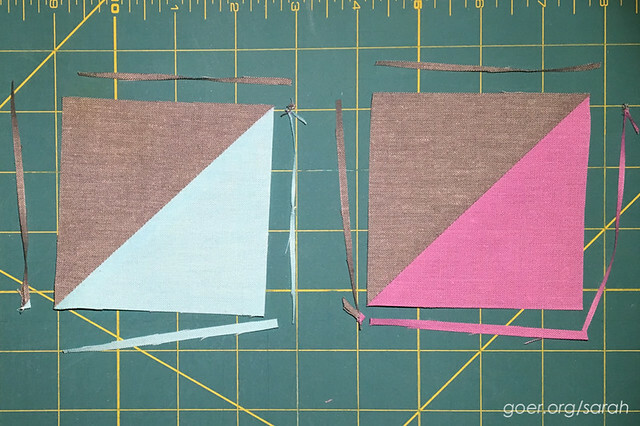 Step 2: Pair each 3.75-inch light squares with a 3.75-inch background square. 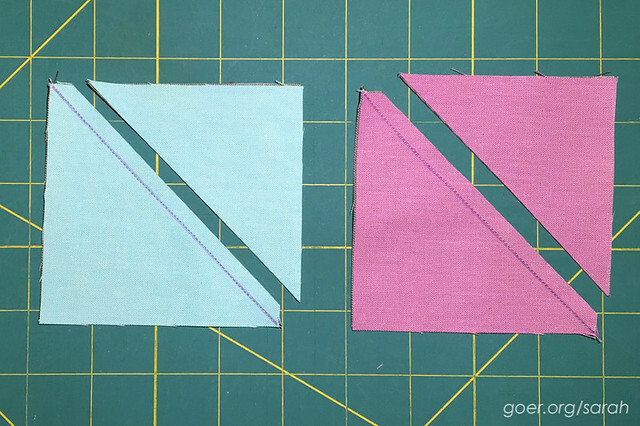 Mark and sew on the diagonal. Trim 1/4-inch from stitching line and press open. Trim to 3.5-inch square. 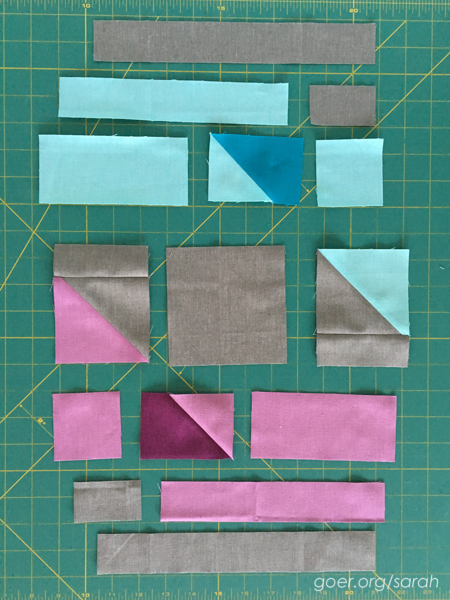 Step 3: Attach HSTs from step 2 to 1.5-inch by 3.5-inch rectangles of background fabric as shown below. Step 4: Piece sections to form each row. Rows should finish at 10.5-inches wide. Step 5: Attach rows in order shown. Pay particular attention to matching up points. These photos show how I matched up my points when connecting rows 4 and 5. 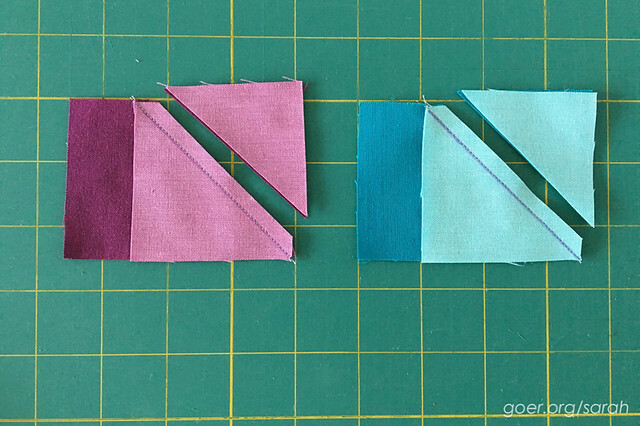 Use straight pin to go through the fabric 1/4-inch from the edge, directly through the seams for each triangle. 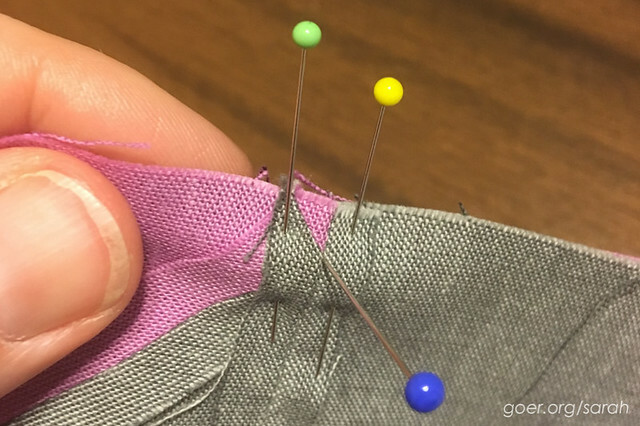 Pin should be perpendicular to fabrics. 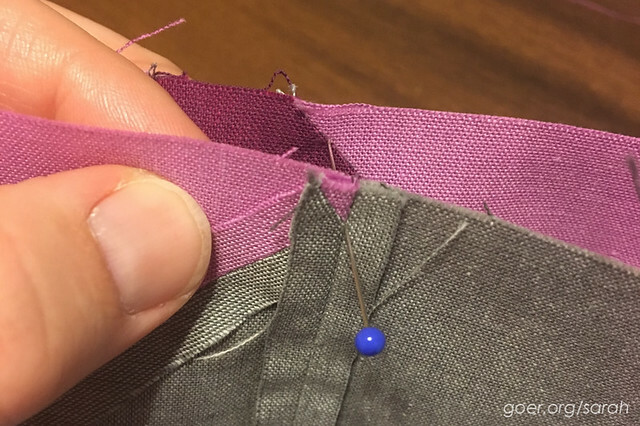 Push layers of fabric together so they are flush, then pin fabrics together on either side of the vertical pin. Remove vertical pin and sew. Once all rows are connected, your block should look like this. 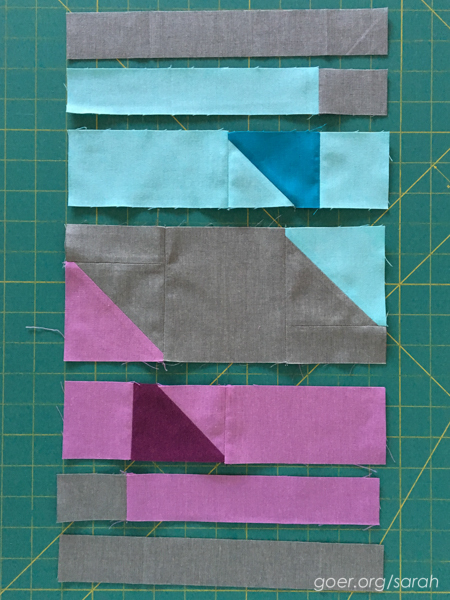 Step 6: Attach 1.5-inch by 12.5-inch background rectangles to each side to finish the block. Unfinished block should measure 12.5-inches square. 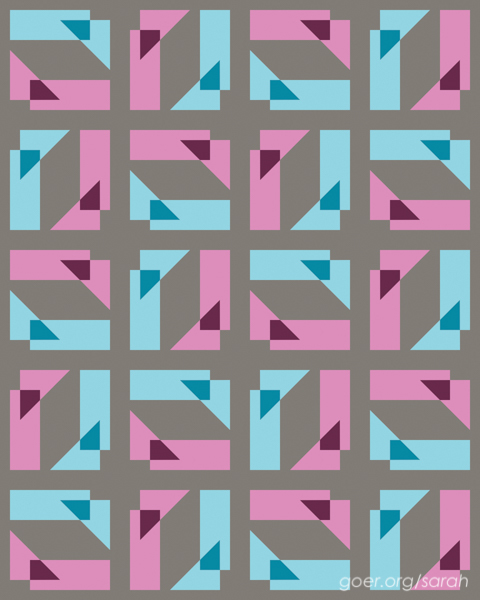 Each of the following options is made with 20 identical blocks, creating a quilt with a finished size of approximately 48" by 60". Visit Meadow Mist Designs on the 13th and Late Night Quilter on the 14th for links to the remaining participants. Thank you for visiting! I'm linking up to Main Crush Monday. Posted in Fabric, Quilting. Tags: blog hop, Cloud9 New Block Blog Hop on September 11, 2016 by sarah. Sarah, what a great transparency design! I think the Starburst layout is my favorite! Thank you, Paige. I liked the block more and more as I created alternate settings for it. What an interesting block and so versatile! I love it! Thank you, Sue. It's so fun to see what everyone comes up with. Fabulous block and fabric choices Sarah! Love it! Lovely transparency design Sarah, and I love all the quilt variations. I have to agree with Paige though, Starburst gets my vote. It may be my favorite as well. It was really fun to play with different placements. Thanks for visiting, Kate. Ooh I love the use of the colours to denote transparency! Great block! Thank you, Anne. I'm glad it worked out as I pictured it. I love this. So simple and so many great looking modern options. You rock! Thank you, Velda! I had to stop myself at five layout options. I could have kept playing with the blocks. 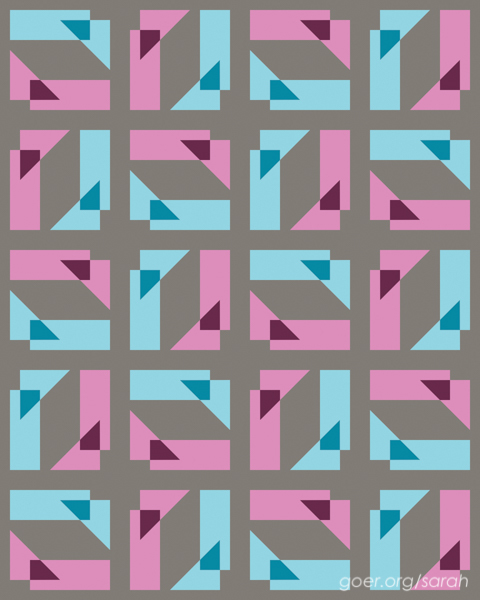 Seeing others' quilts, I wish I had thought to put in some solid squares in place of some of the blocks. 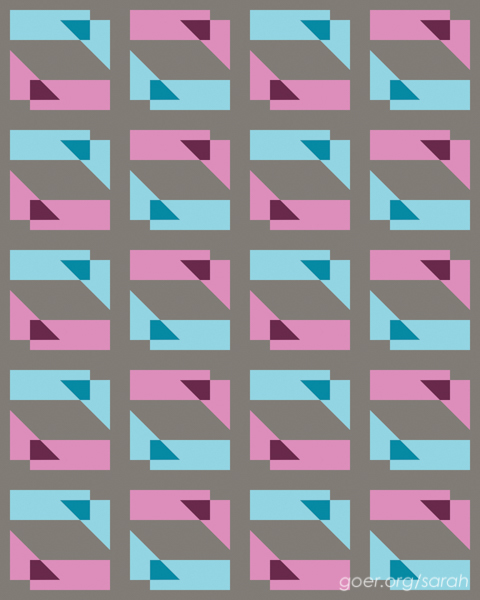 I may have to play more with quilt design possibilities. I also think a companion block might be fun. This block is so unique -- I love it! Sarah, what an awesome block. I love the different names you came up with for your sets. I'm most drawn to the Tossed Set. I really like how the sashing is part of the design. Take care, Mary. It was subconscious, but I don't love the step of adding sashing... just when you feel like you're done with the blocks and making great progress, sashing takes so long to piece. Thank you for visiting, Mary! Being something of a math wonk, I love this design. Oh, that could be great! Please share it with me once you post it! Thanks for visiting, Holly. I really like the transparency effect. I didn't realize what it was until you explained. I love the concept. Well then, I'm glad I explained. :-) Thank you so much for visiting, Jennifer. I love the modern feel of your block and, better still, the quilt top. Thanks for the tip on matching seams...yours are perfect. Hi Sarah. I think your block is my favorite of the Day 1 blog hop =) It is surely something else. Very a modern block with lots of assembly options. Oh, thank you so much! I'm so glad you enjoy it. Thanks for visiting, Puppilalla. WOW! What a great block! 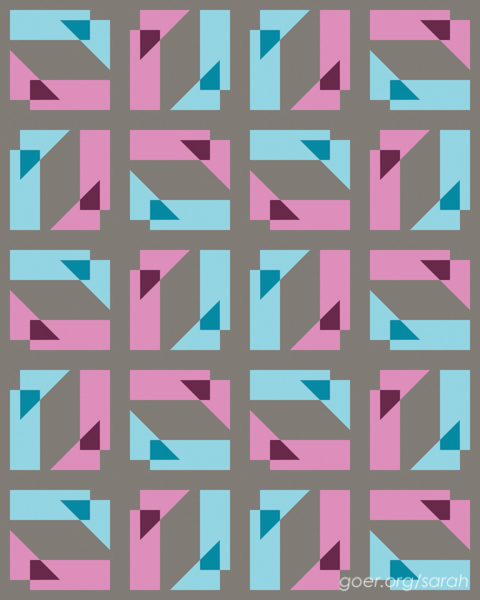 I love seeing it in a quilt design. Are you going to make a quilt with it one day?! Its a beautiful design! I might. There's a lot on my plate in the short term, so if I do it won't be for a while. Thank you so much, Jayne! 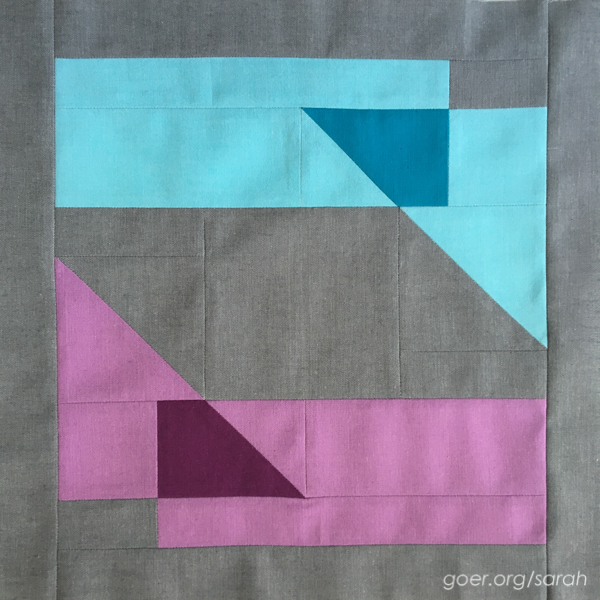 Love the uniqueness of your block and how perfect it is for a modern quilt. Your tutorial is very clear and so easy to follow. Great job Sarah! Love this block! I love the transparency in the quilt layout -- I have to say, I love the randomness of the Tossed layout! Great job! The Tossed layout is one of my top two favorites. If I make a complete quilt top I'm gonna have to think hard on which one to make. Thanks for visiting, Kim. Thanks, Yvonne. I thought you'd like it. ;-) Thank you for all the work to organize the hop. It's so fun to see what everyone comes up with. Love this block Sarah - I like the idea of transparency but haven't yet used it in any of my quilts yet .... this block may just be the push I need! Be sure to share with me if you do make it! I'm glad I can help inspire you! I don't work with solids only very often, so I hadn't worked with transparency before now. Thanks for visiting, Abigail! Pretty clever block...looks like a lot of work, but clever nonetheless....and for a great cause!! It is kind of a lot of pieces for a 12" block. I did ask my self as I made my one block, how excited am I about making 20 or 35 of them? All I know for sure is that I don't have time for that at the moment. ;-) Thanks for your comment, Bo. So many options! I certainly like it with a grey background better than I would with a solid white, though I generally don't prefer a solid white background. I would enjoy playing with the other colors within the block. Thanks for visiting, Melva! Thanks, Sarah. You should definitely play with design using transparency. There's so much potential! Seems like there's a lot of play with transparency and ombre looks. This is beautiful. Saving it for future blocks to try! Thanks, Jess! 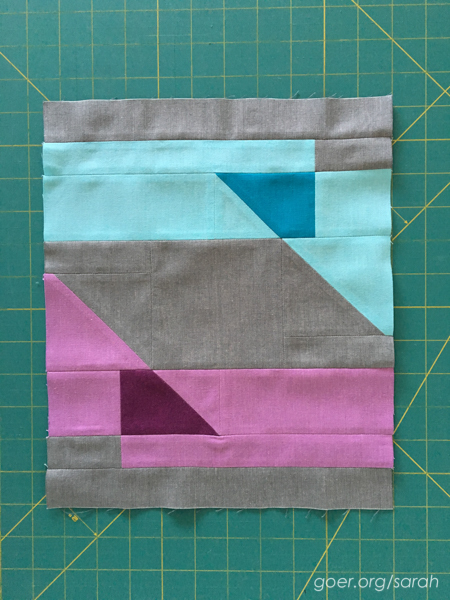 I may need to find the time to make a lap quilt using my block. Let me know if you try it out! Thank you for your kind comments, Olusola. I love how you played with transparency here, and the shapes are unexpected and interesting! Great job, Sarah! I love all the layouts, but I think the Alternate Set is my favorite. Sarah this is a great block. I love how some of the alternate settings hint at large star blocks. I like that as well. The more I played with block layout, the more I liked the block. ;-) Thanks for visiting, Stephanie! This is an interesting block. Each layout out option has a different voice. Thank you, Lori. I'm pleased that the design transformed into something so versatile. Beautiful work on your block, Sarah! I love how you used transparency in your design. So fun!! Thank you, Amanda! There have been so many excellent quilts featuring transparency in the last year or so. It was fun to try it out. Awesome block! And the many layouts are great. Cool block, and I love all the settings. All of it is really unique. Nice job! Very nice block Sarah. I like the geometric shapes. It's very striking and a quilt I could see myself making. I'm so glad that you like it and I hope you'll share pictures if you decide to make it. Thanks for visiting, Lisa. Totally modern block - reminds me of Star Trek (which in my book is a good thing!) I like how different it looks when you spin the blocks around. This is a super cool design! Thank you so much, Carrie. How fun that it reminded you or something you enjoy. My favorite part is the variety of quilt designs from the one block. Thanks for visiting! Wow! 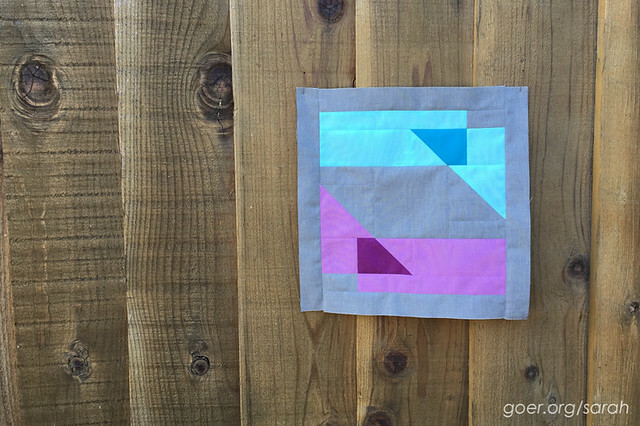 Your block is very different - this is going to be an awesome quilt! Lovely block Sarah! So many layout options! Happy hopping. Thank you, Amanda. I'm really enjoying seeing what everyone has come up with! It was so fun seeing some of the possibilities with your wonderful design! 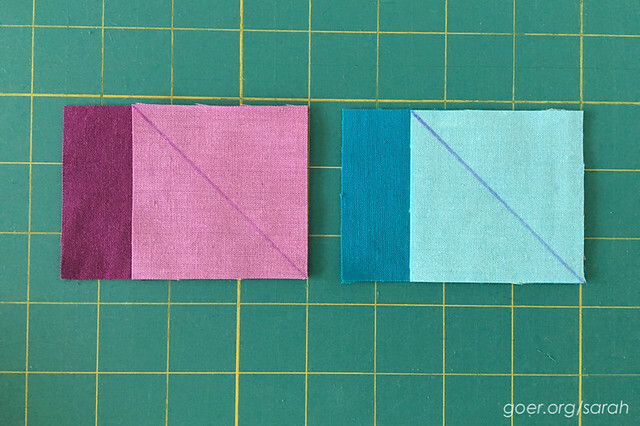 There are so many ways to use this block and make multiple quilts that all look different. Great design Sarah! Very interesting block. I really love blocks that rotate. Thank you. I had fun with it and can see myself playing with some similar designs. I love how you were able to create such interesting shapes with traditional piecing, beautiful! Great block design...love the illusion of transparency! I also enjoyed all the quilt top layout possibilities!